The Amazon Rainforest, also known as the Amazon Jungle, is located in South America in an area known as the Amazon River basin. While the forest covers several countries, the largest percentage can be found in Brazil and Peru. Smaller portions exist in countries like Venezuela, Colombia, French Guiana, Ecuador, Bolivia, Guyana, and Suriname. 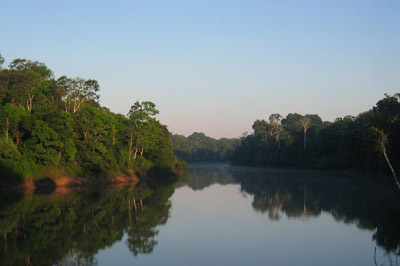 The Amazon Rainforest is the largest rainforest in the world and makes up about half of the planet’s rainforest space. It is also home to the greatest river in terms of drainage and discharge. According to scientists, the Amazon Jungle was created millions of years ago when the Amazon River changed direction from west to east. It most likely formed during the Eocena period following a drop in tropical temperatures. The Amazon Rainforest is also one of the world’s largest eco-systems, containing one of the most diverse array of species on Earth. Many medical and pharmaceutical agencies run research projects in the jungle, gaining plant knowledge and experimenting with new drugs. In modern day, many things are threatening the livelihood of the forest. Foremost among them is the deforestation that is taking place to clear land for farming and raising livestock. Many animals are being pushed out of their homes, as over 100,000 square kilometers were destroyed between 1990 and 2000 alone. Before 1960, access to Amazon interior was restricted, but due to farming practices in the later years, there has been a lot of damage to the Forests. Scientists are not only upset about the potential loss of bio-diversity, but also about the amount of carbon contained within the plants that is being released through destruction of the forest. The amount of gas that could be released could adversely affect global warming. omg so good great for peru assingments!!!! !